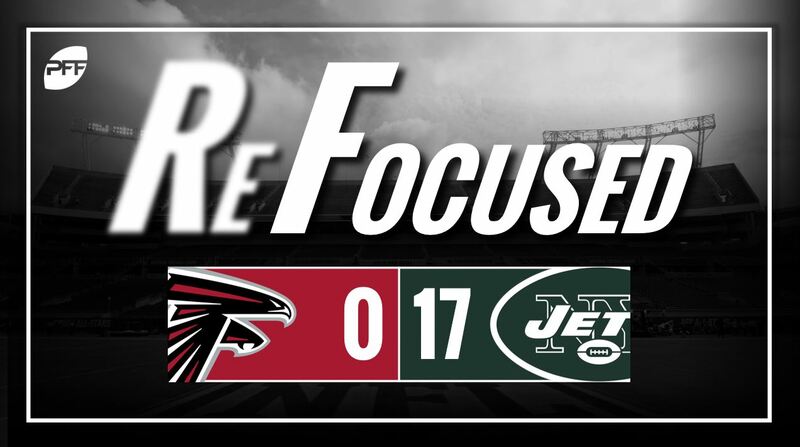 The New York Jets defeated the Atlanta Falcons on Friday night, 17-0 continuing the first full week of preseason action in the NFL. The Falcons’ lack of explosiveness resulted in a stagnant offense throughout the night. Despite skill players failing to create much after the catch, Atlanta remained content in constantly throwing underneath the markers. This was evident in the first half, as the Falcons completed all of their passes but had only one first down. The Falcons also struggled to get much going on the ground against the Jets’ swarming run defense. For most of the game, Atlanta struggled to control its blocks at the point of attack. It was late in the game before the Falcons were able to create big enough lanes for their backs to build some steam. Atlanta’s cornerbacks and linebackers made a number of solid open field tackles on New York’s swing passes to running backs but struggled to maintain positioning on crossing routes. Whether it was zone or man, if the Jets quarterbacks had time they were able to repeatedly find open targets on crossers, both underneath and downfield. Edge player Anthony Winbush saw extended time and made the most of his reps. His quickness at the point of attack allowed him to consistently beat blockers, both on run plays and when rushing the passer. Rookie quarterback Sam Darnold didn’t move the ball as well in the second half, but he led the Jets on an impressive touchdown drive in the two-minute drill to end the 2nd quarter. A great sign considering the amount of turnover-worthy plays he produced last year at USC. The most impressive facet of his game tonight was his poise. He handled the rush well, side-stepping the rush numerous times and resetting to throw accurate balls to safe targets. Teddy Bridgewater impressed in his return to action. While he didn’t have to make any difficult throws, it was his ability to identify and adjust to pressure while keeping his eyes downfield that allowed him to consistently find open targets. The Jets’ defensive backs did a good job of keeping everything in front of them. They were consistent in tackling after the catch, and they were rarely beaten deep. The Jets didn’t need to blitz to supply pressure against the Falcons’ offensive line. Of their 16 forced pressures, 11 were generated with just four pass rushers. The Jets often utilized their power, as seven of their pressures were forced with a bullrush. New York: The Jets quarterbacks played well tonight, as they did not force the ball into danger areas and made accurate throws to shallow and intermediate receivers alike. Atlanta: The Falcons lack of explosiveness and discipline resulted in a stagnant offense throughout the night.